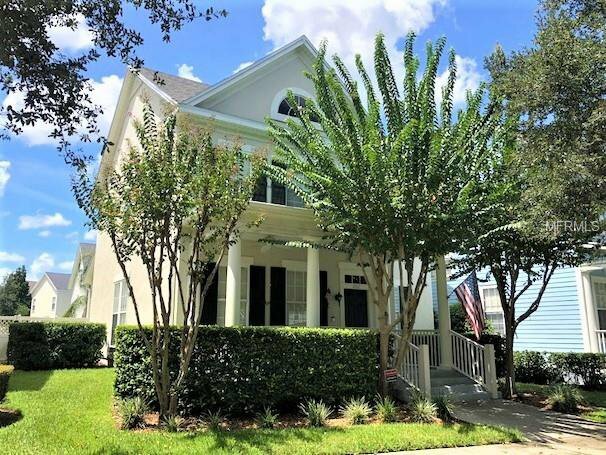 Fully Renovated 4 bed 3 ½ bath Single Family Pool Home in Celebration. Over 3,200 sq ft of living space on an oversized Lot with huge Tropical Pool, Natural Stone Pool Deck, plenty of Yard space & a Garage Apt above the detached 2 Car Garage. The Home sits in front of a Nature Conservation Park. This first level of this home features a Formal Living Room, Formal Dining Room, Office or additional Bedroom, Family Room with Vaulted Ceilings & Wood burning Fireplace, Large gourmet Kitchen with Breakfast Room & 1/2 Bath. The entire Down Stairs has been completely remodeled with new Flooring, Paint, Bar area with Mosaic Tile Backsplash & Wine Fridge & completely renovated Kitchen. The Kitchen has upgraded Cabinets, Mosaic Tile Backsplash, massive Island with waterfall Granite sides, & new Stainless Steel Appliances. French Doors from the living room open out to the Pool which has a new Salt Water System. The 2nd Level has the Master Suite with updated Bathroom with Garden Soaking Jacuzzi Tub, Seamless Glass Shower Stall, Double Vessel Vanity & Huge Walk in Closet. 2 additional beds share an updated bath. All new Carpet on the 2nd level were installed in 2017. New Roof installed in 2018 on the Main House & Garage Apt. All 3 ACs have been replaced, the Main Houses ACs in 2018 (upstairs), 2016 (downstairs) & 2014 for the Garage Apt. Fiber optic lines were installed in 2018. Garage Apt is currently leased till May of 2019 for $1,100 per month. This home is priced to sell, make you appointment today! Listing courtesy of C21 BLUE SKY REALTY GROUP. Selling Office: C21 BLUE SKY REALTY GROUP.